Back in 1996 when I first went into business for myself, I named my company “Automation Consulting Services”. At the time, I wasn’t really sure exactly what a consultant was, but coming from a technical sales background I thought that what I did as a product specialist sort of fit the bill. During the ten years of that company’s existence I never did a job that could qualify as consulting. During the first 5 or 6 years I built control panels, wired machines and wrote software. After that I started building machinery myself and became more of a custom machine builder focusing on gauging, inspection and material handling. But the name remained. I would often sit down with a customer and discuss the project and make suggestions where appropriate, but since the customers pretty much knew what they wanted I didn’t consider it consulting. Besides, there was always a big hardware component involved that overshadowed any advice I might give. When I re-started my company in 2012 I decided to keep the old name even though I had moved to a new city and intended to stay a one-man operation. I dropped the “Services” part of the name and became Automation Consulting, LLC. For a while I picked up contract work writing controls software and design work. Then about a year ago I started teaching PLC classes for Automation Training. I did do some small design and concepting jobs that sort of qualified as consulting, but again in most cases the scope of the project was always pretty well defined by the time I got involved. I even wrote a book that is being used in some engineering classes across the US and overseas. This March I got involved with what I would consider my first real consulting job. A small machine builder had received a massive order and grew from about 30 people to almost 200 in less than a year! I was brought in to help organize the controls and engineering department and provide expertise from my experience with large machine builders. Results were mixed on this project. While I was able to provide some useful tools and methods for the company, so much of the project was defined by the end-user that I found very little leeway to implement the procedures on their current project. Though hopefully the things I provided will be of use on future projects, I felt a little disillusioned with the process. 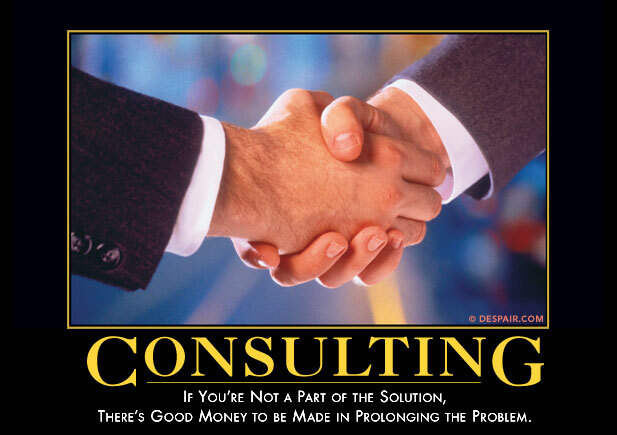 So my question for readers is this: what really qualifies as consulting anyway? To me, when I am teaching a programming class and students are really engaged, I feel like I am providing consulting services to people who want to learn new methods of accomplishing things. When I am designing and programming, I feel that I am engaged in a creative activity that could also qualify as consulting. When on a sales call discussing a new machine or project I certainly feel that I am providing valuable information and methods since the system is still in the concept stage, even though a sales meeting itself brings in no income. The idea of consulting always brings to mind a guy in a suit expounding on how things should be done without actually providing a product as such. And of course the guy is paid a large “consulting” fee rather than working on a time-based contract. This view of consulting rarely applies to my work. Is training consulting? How about system design? Should one’s fees be based on a percentage of results or is it OK to charge based on time? When I re-started my business I bought a couple of books on consulting. It is hard to relate most of the subject matter to my area of expertise, but the image I got was more of the “guy in a suit” than a teacher or designer. For those of you that are consultants but not in my field, what does your job entail? Thanks for your input! Am an Electrical Engineering Design Consultant for Thermal Power Plants. 4.is affordable with fees based on both percentage of results and on time and resources expended.